When I arrived at the Edgewood trailhead yesterday morning, it was a chilly 55 degrees and slightly drizzling. I love hiking in cool weather, so I was thrilled. 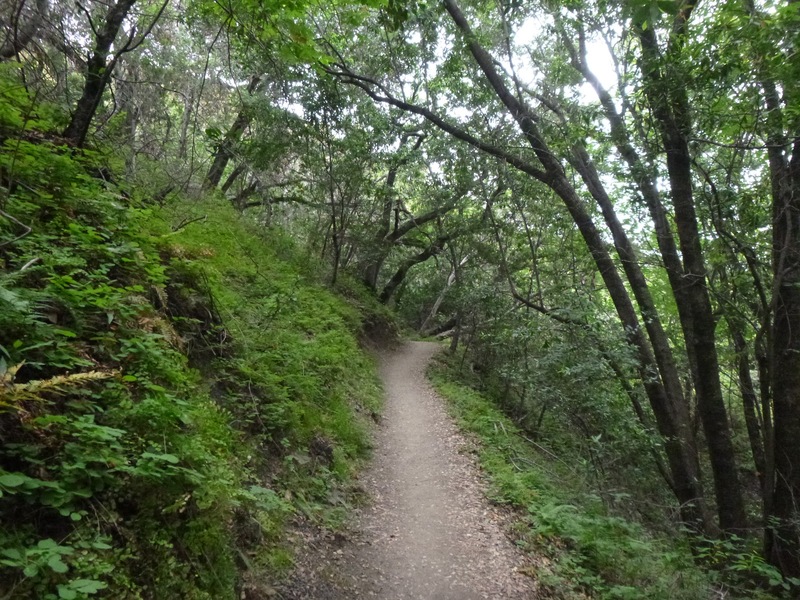 I had hiked at Pulgas just last week, and as always the contrast between the two parks was curious. There's just a canyon between them and the terrain is similar, with both hosting chaparral, woods, creeks, and oak grassland. But Pulgas was dry last week, and the woods were choked with thistles. Edgewood's shaded trails were still remarkably green and lush and there were flowers blooming everywhere. Yesterday Ithuriel's spear was my most commonly-spotted flower, blooming in both grassland and woods. 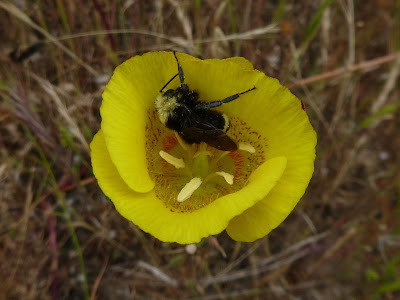 Hundreds of yellow mariposa lilies brightened the sides of the trails. Purple clarkia huddled together staining grassland purple in patches. One of my all time favorite flowers, clay mariposa lily, was blooming on Sylvan Trail. Fairy lanterns are going to seed, but some remained in the woods. I noticed two flowers new to me, wiry snapdragon and Calistoga pincushionplant. This was my 4 mile route: starting from the main trailhead, I began on Edgewood Trail, then took Franciscan, Ridgeview, Live Oak, Serpentine, Clarkia, retraced back on Serpentine, and finished on Sylvan. Note that some trail names have changed in the past year, but the park is very well signed. Read more about Edgewood on BAHiker.